Experienced full back Kevin signed for City in September 2017 from Sutton United. He began his footballing career as a trainee with Bristol City – when he also earned a single cap for the England U18 side – and went on to make over 50 appearances for the Ashton Gate. After suffering a neck injury in a car crash in March 2002 he struggling to regain his starting place and spent loan spells with Torquay United and Cheltenham Town. A third loan spell at Yeovil Town ended with the defender joining the Glovers permanently in 2005. After one season in Somerset he joined Swansea City for £250,000 in July 2006. After playing 29 games during his first season with the Swans he was restricted to just four games in the FA Cup and Johnstone’s Paint Trophy the next year and moved on to Swindon Town in June 2008. He played over 100 times for the Robins before spells with Burton Albion. Rochdale, Exeter City and Northampton Town. 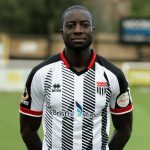 In February 2014 the 35 year old dropped into Non-League football with then Conference Premier side Salisbury City then six months later moved onto Sutton United. Whilst with the Us he helped them to the Conference South title and their famous run to the FA Cup 5th Round.